While I was away last month Geoff from GT Tooling built my battery trey. Yesterday I installed it and the VFD in the tray. Beneath the trey there are 4 stainless steel square tube cross members to help support the batteries, act as spacers for the bolts to the trey structure and to support the VFD. 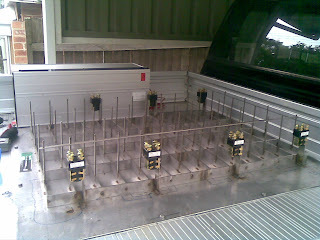 The contactors are visible on the posts vertical supports. The connections will be the same height as the battery terminals. Each threaded rod will be covered with heat shrink to prevent the batteries from being abraded in case they come in contact. 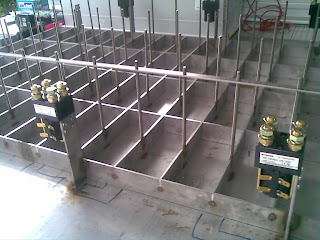 All components of the battery trey are stainless steel. Next weekend I hope to install the batteries and start connecting them. The interconnects where practical will be made from copper strip. The rest will be 16mm^2 cable with appropriate lugs crimped on. The straps to hold the batteries down will also be covered in heatshrink to provide additional insulation to the Battery Balance Circuits. Looking good! I call shotgun.